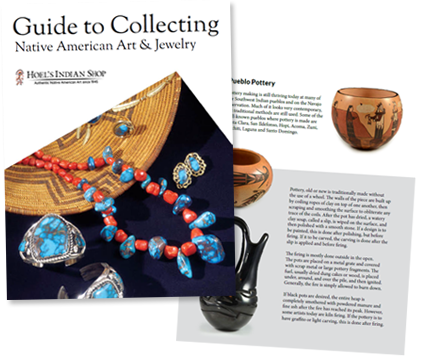 Award-winning Ida Sahmie is known best for her pastiche of Navajo designs and Hopi pottery techniques. “Ida’s work straddles both cultures, and she reached the celebrity plateau years ago,” note Allan Hayes, John Blom, and Carol Hayes in Southwestern Pottery: Anasazi to Zuni. 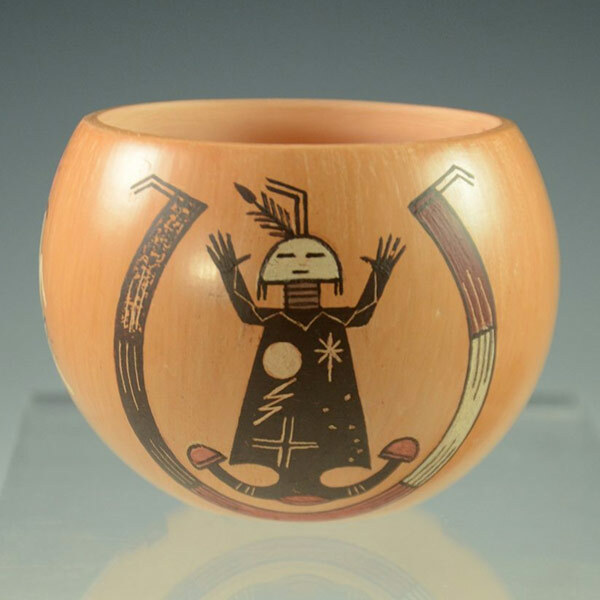 Now, Ida draws on both Navajo and Hopi traditions, depicting Navajo designs – including scared imagery that must be exact or sometimes requires a Night Chant ceremony – and preferring a peachy mix of natural white and yellow clay dug on the Navajo reservation, but using Hopi coiling and firing techniques. “Personally, I feel I have a unique talent with pottery. It’s a combination of both Hopi and Navajo, though I feel it should be more Navajo because I am a Navajo,” she notes in Fourteen Families in Pueblo Pottery. Among other accolades, Ida won best of class and second place at the 2010 Navajo Nation Fair. Her work is in the collections of the Smithsonian and the Dallas Museum of Art.